That’s right, things are about to get hot, in more ways than one! We’ve been cooking up some ideas and the game designers have been working hard at creating a balanced game formula. Our artists have also been drafting up concept and character art for our brand new world. It’s a working title and nothing is set in stone, but we’re loving the concept! Holy Potatoes! What the Hell?! 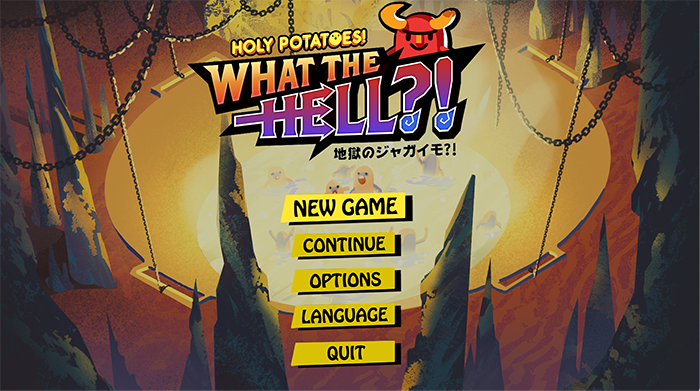 is going to be a demonic hell-themed game where you will assume the role of a gate keeper/chef, cooking sinful potatoes into delicious dishes fit for the Gods! Heheh, it may sound horrible but… we prefer the term ‘morbidly cute’! 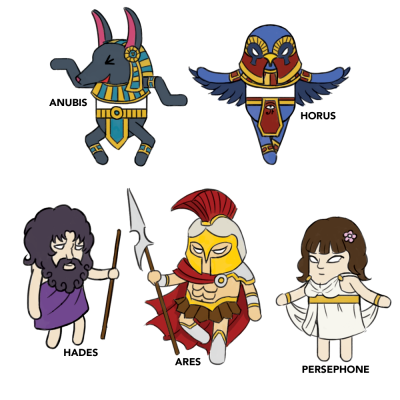 We have four pantheons at the moment; Greek, Egyptian, Norse and Japanese. Players will have to try and gain favor with them in order to progress to the next stage, so try not to mess up their orders! 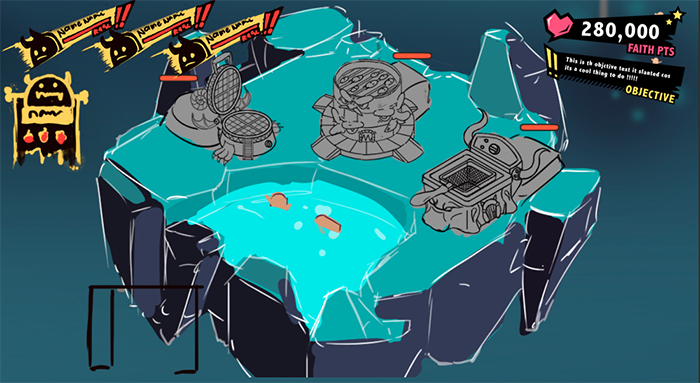 Players will sort potato sinners into various machines to produce mashed, boiled, baked, and fried potatoes to use the ingredients to create a dish, which will be served to a God! You can upgrade your stations so they produce secondary ingredients like salt or pepper, fix’em when they break, and organize them so that you have your own customized kitchen! We’re thinking about adding a variety of stations but things are still in it’s planning stage! At the moment we’re thinking of implementing 9 Stages – for the 9 Circles of Hell! 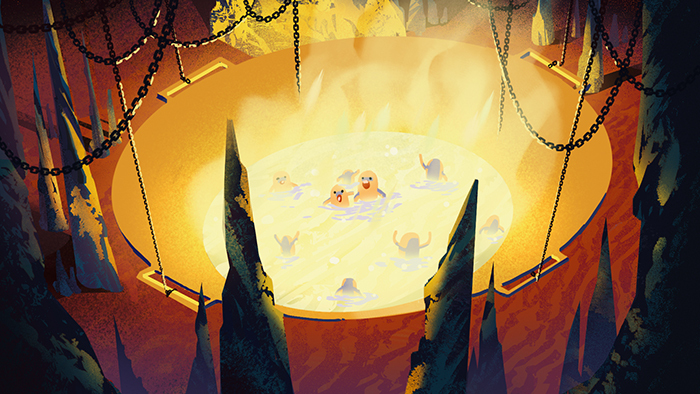 Each stage will have a different environment and theme, such as a windy stage for the Lust circle and a slushy, vile stage filled with gross blobs of stuff for the Gluttony circle. As it stands, Holy Potatoes! What the Hell?! is still in its early inception stage and we have a small prototype up and running so we can test various scenarios, but we don’t really have any gameplay we can show off just yet! Having said that, we will begin live streaming our development progress on Twitch, where you guys can come down to ask us questions and we will be showing everyone a sneak peak on what it is like to develop a game from start to finish! Also, we will be posting regular updates on our development progress through our Behind the Spud posts, social media, and our Discord channel. I hope you spuds are as excited as we are about our upcoming game! It’s hella(hah) fun coming up with new ideas, and if you guys have any suggestions, why not drop us a line in our Discord channel? We typically reply within 24hrs, so come and chat with us! 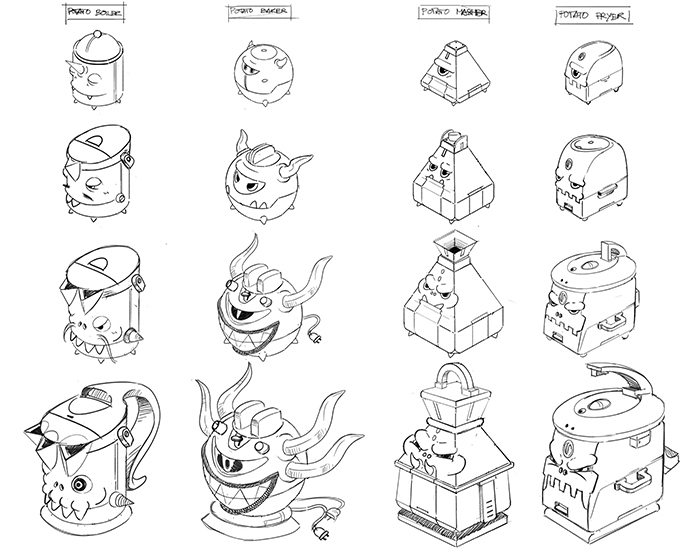 Things are still brewing behind the scenes so keep checking back here for more updates, heh! Get yo wallets out and ready to spend your $tarch spuds and spudettes… because Holy Potatoes! Take My Money!! is now LIVE! That’s right — for all you spuddies who’ve been coveting the big and fluffy Mochi or huggable Jagamaru, they can now appear right at your doorstep! Anddd, we’re having a 5% off storewide launch sale until the 24th of May 2017! 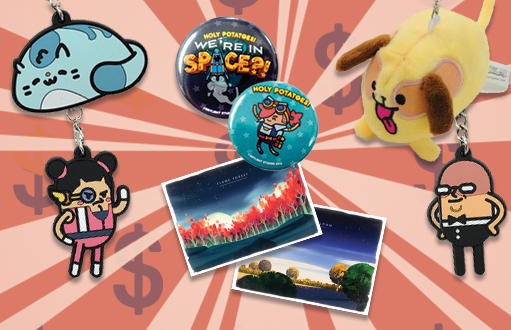 Our merch store also stocks various character keychains, apparel and even postcards! Plus, we ship internationally — so what’s stopping you from getting your very own Jagamaru to cuddle? ;D Go on over and get your very own cuddle buddy if you haven’t already!